Last weekend, I sat on a panel at the 2012 Wine Bloggers Conference in Portland, OR, discussing wine blog monetization – what works, what doesn’t, and what you need to consider to monetize both your blog’s website and your blog’s brand. Below is a video that I recorded in Santa Barbara wine country just prior to flying to Portland for the conference, and you can treat it as the expanded version of the talk that I gave at WBC12 (for those who were there, I told you that you wouldn’t have to take notes!). 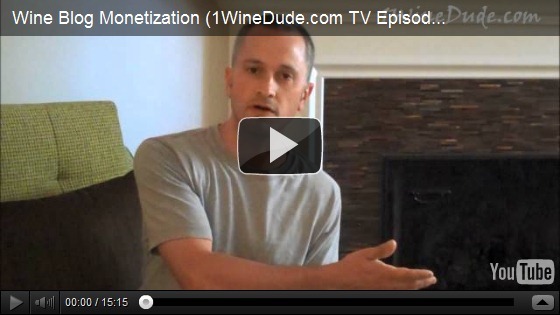 Want to know what I’ve learned about making money in the wild west territory of the ever-changing online wine world? Have a seat and take a view. Joe, as someone who could not be at #WBC12, I appreciate this virtual connect to a panel discussion I would have liked to attend. Also appreciate the straight dope on the current landscape and some very basic concepts. Aside from some affiliate links, I've not done a lot to actually monetize my digital surface area, and really should. It's a no-brainer. I initially saw the blog as a simple journal of 'real-world' wine exploits in and around VT, but it has in fact, been a real catalyst for connection and opportunity. The calls do come, and gigs do happen. Thanks, Todd – missed you in Portland, man! Hi Joe – As always, I appreciate your frank and honest comments on the business of wine blogging. And, since I sadly had to miss WBC this year, it’s great to get some insight into one of the panels. I was just in Santa Barbara, too (and may even have stayed at the same place – that fireplace looks awfully familiar). Not sure if you’re planning to write about that but I am curious to hear your thoughts on the wine scene there. Thanks, Lesley – sorry, I think your comment got lost in the shuffle of my site migration to a new provider over the last couple of days so I’m a bi slow to respond on this one. I was pretty impressed overall with the wine scene in SB, so more to come on that one. Stay tuned! Cheers! Thanks Joe. Out of all the panels that were at the WBC, this is one topic I was interested in especially with you on the panel. I wish I could have made it but like you said, I probably heard more here from your video than you probably spoke at the conference. Thanks for the good information and we'll catch you at some future event! 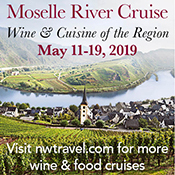 @TXWineLover – Thanks, would have been great to meet you! Maybe in 2013? TX – I do remember! But still hoping we can meet up again at WBC next year :).